Tehachapi Valley Wrestling Club has been busy with local Bakersfield mat action. TVWC competed March 30 at the KCWA Rebel Rumble hosted at South High School with 13 wrestlers bringing home medals. The Jacobsen Middle School track and field season is off to another great start. The team participated in the Ridgecrest Junior Olympic Track Meet on March 30. It's good to be the home team. When it comes to policy, not much good normally comes out of the Bay Area; those of us who have lived in this state long enough understand that. However, I’m never one for shorting credit where credit it due, and for the first time in recent memory, the Bay Area might be on to something. The Tehachapi Valley Recreation & Park District has come together with the Warrior Booster Club to put on the Warrior Challenge, sponsored by Aspen Builders Inc. The race will be held at 9 a.m. Saturday, May 18 at Philip Marx Central Park. Chalk this one up to social media once again getting it wrong, or at least blowing it completely out of proportion. Long before the ability to record every waking moment for later playback, review and outrage, we lived much simpler and rational lives. Sometimes I wish it were still that way. Tehachapi Valley Wrestling Club had 12 wrestlers compete in Freestyle at the KCWA Foothill Jr. Tournament March 23 hosted by Foothill Jr. Wrestling Club. The Tehachapi Gryphons Soccer Club will hold free tryouts for its 2019-2020 fall soccer program in April. BY DARLA A. BAKER dbaker@tehachapinews. Tehachapi Valley Recreation & Park District reported a successful season by wrapping up its youth basketball season March 16 with division championships. Tehachapi Valley Wrestling Club sent six wrestlers to the California USA Wrestling Folkstyle State Tournament held in Fresno on March 9 and 10. Tehachapi High School Track and Field split up again as the Frosh/Soph boys and girls teams traveled to Bakersfield High School to compete in the Frontier Frosh/Soph Relays, while the Varsity boys and girls of THS traveled to Taft to participate in the Wildcat Invitational. Tehachapi Valley Wrestling Club started its spring season of Freestyle and Greco-Roman wrestling. All right winter, enough already. We get it, but it’s time to play ball. Tehachapi Valley Wrestling Club recently finished their folkstyle season with the CVYWA Masters Tournament and KCWA Folkstyle Championships. The weekend of Feb. 23 and 24, Tehachapi mountain bike team had their first cross-country mountain bike race of the season. Thirty-four Tehachapi students went head to head against 1,057 riders from Southern California and brought home a third-place medal along with many top finishes. Local Tehachapi BMX racer Jeremy Ireland earned his 10th win in the Novice Class racing at Metro BMX in Bakersfield on Feb. 24. Jeremy, 30, will now move up in proficiency to the Intermediate Class. Perfect 10’s Competitive Boys Team competed at the SCMGA North Conference Championships on Sunday, Feb. 17, at Victory Gymnastics in Newbury Park. All of Perfect 10’s boys team members met the qualifying placement to be eligible to compete at state championships. The Tehachapi Lady Warriors struggled from the field and couldn’t survive the onslaught of three-pointers in a 73-46 loss at Bakersfield High School in the CIF Central Section Division II semifinals. The Tehachapi High School Freshman Basketball Team won first place in League play with a record of nine wins and one loss. Once again it’s mountain bike season. It’s the time of year when 40 Tehachapi students brave the cold weather and mountainous terrain to prepare for NICA’s SoCal mountain bike races. 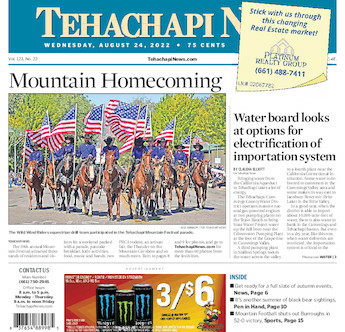 It’s been a banner week for Tehachapi home basketball. The crowds were great, the support hit the next level and for the Lady Warriors, that helped them advance to the CIF Central Section Division II semifinals. Tehachapi Valley Wrestling Club competed in the South Section Valley Qualifying Tournament in Porterville on Feb. 10. TVWC had 20 wrestlers putting their skills to the test with 17 of them qualifying for the Masters tournament. The Lady Warriors wrapped up the soccer season "leaving it all on the field." Unfortunately, their passionate play was not rewarded with a win in the last five games. Despite a 52-41 loss in the regular-season finale that cost the Lady Warriors the outright South Yosemite League championship, Tehachapi was still awarded the fourth seed in the upcoming CIF Central Section Division II Playoffs and could have two home games in their quest for a CIF Championship. Well, here we go, it’s playoffs time, and as they say, “all roads lead to Selland Arena,” the home of the CIF Central Section Basketball Championships. Senior Meghan Daffern joined a host of other Kern County athletes this past week signing a National Letter of Intent to continue their education and playing careers at a four-year institution. Tehachapi Valley Wrestling Club Sent three of its middle school wrestlers to the Dinuba Invitational on Jan. 26.